Fit Freeway is a new iOS application, which works alongside regular cardio machines to track exactly how you’re exercising. It closely reads all kinds of subtle vibrations and movements, which are then translated into actions on a video game on the screen. So, the faster and harder you work the better you’ll do inside the game. 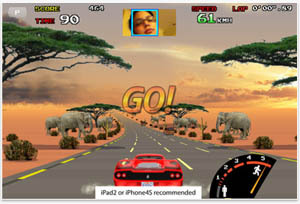 The thing we love most about the app is you don’t just run through a fake field or bike down a fake road, but you essentially ‘become’ a racing car, and you can steer it by tilting your head left or right. We think Fit Freeway is a very interesting app that could well give people the extra shot of motivation they need when they’re working out. But however much you and your body may benefit, just be prepared to look a bit silly while you’re doing it. You can download Fit Freeway from the iTunes store for £1.99. One Response to "Fit Freeway iPhone app lets you work out within a video game"